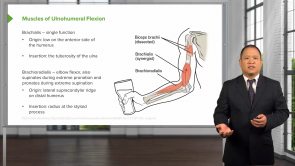 This course covers the anatomy and biomechanics of the elbow and the clinical implications of this region's somatic dysfunctions. You will be given the opportunity to test your diagnostic skills when faced with potential or actual elbow dysfunction. You will be taken on a journey through the anatomy of this region, including the muscles, ligaments, and nerves that surround the joint. With this knowledge, you will then learn to apply the appropriate diagnostic tests for any clinical presentation involving the elbow.